Magnolias are spectacular plants that provide beautiful blossoms in shades of purple, pink, red, cream, white and even yellow. Magnolias are famous for their blooms, but some varieties of magnolia trees are appreciated for their lush foliage too. 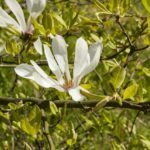 Varieties of magnolia trees encompass a vast range of plants in various sizes, shapes and colors. Although there are many different types of magnolia, many of the most popular varieties are classified as evergreen or deciduous. Read on for a small sampling of the many different types of magnolia trees and shrubs. Southern magnolia (Magnolia grandiflora) – Also known as Bull Bay, southern magnolia displays shiny foliage and fragrant, pure white blooms that turn creamy white as the flowers mature. This large multi-trunked tree can reach heights of up to 80 feet. Sweet Bay (Magnolia virginiana) – Produces fragrant, creamy white blooms throughout late spring and summer, accentuated by contrasting bright green leaves with white undersides. This magnolia tree type reaches heights of up to 50 feet. Champaca (Michelia champaca) – This variety is distinctive for its large, bright green leaves and extremely fragrant orange-yellow blooms. At 10 to 30 feet, this plant is suitable as either a shrub or small tree. Banana shrub (Michelia figa) – May reach heights of up to 15 feet, but usually tops out at about 8 feet. This variety is appreciated for its glossy green foliage and creamy yellow blooms edged in brownish purple. Star magnolia (Magnolia stellata) – Cold hardy early bloomer that produces masses of white flowers in late winter and early spring. Mature size is 15 feet or more. Bigleaf magnolia (Magnolia macrophylla) – Slow-growing variety appropriately named for its massive leaves and dinner plant-sized, sweet-smelling white flowers. Mature height is about 30 feet. Oyama magnolia (Magnola sieboldii) – At heights of only 6 to 15 feet, this magnolia tree type is well-suited for a small yard. Buds emerge with Japanese lantern shapes, eventually turning into fragrant white cups with contrasting red stamens. Cucumber tree (Magnola accuminata) – Displays greenish-yellow blooms in late spring and summer, followed by attractive red seed pods. Mature height is 60 to 80 feet; however, smaller varieties reaching 15 to 35 feet are available.